Sinangag is Filipino garlic fried rice. It is a popular side to almost all Filipino breakfast dishes. It often made using leftover or day old rice. I don’t need an alarm clock to wake me when sinangag is cooking in the kitchen. The fragrant aroma of Filipino garlic fried rice is enough to get me racing to the dining table with my face washed and hair combed no matter the hour in the morning. Sinangag is pronounced see-na-nag. Filipino garlic fried rice is typically made using day old rice. As in many Asian cultures, no food should ever be wasted. Yesterday’s leftover rice becomes today’s fried rice. 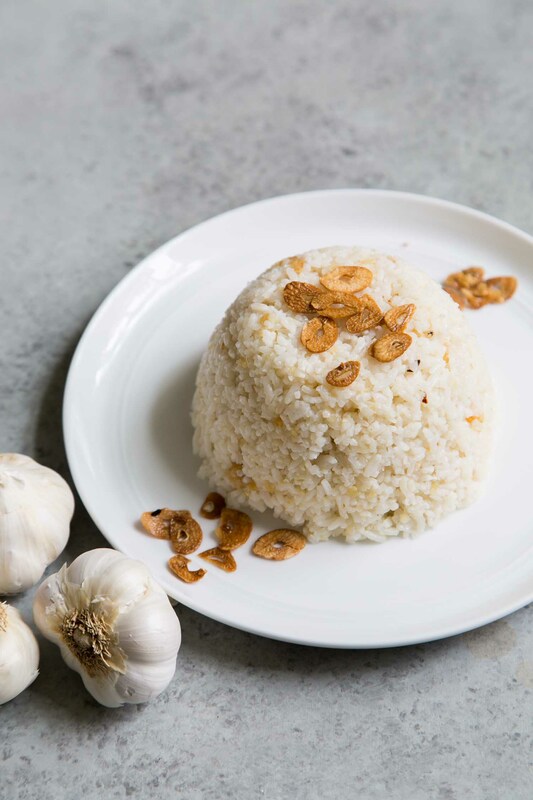 There are only four ingredients required to make sinangag: Jasmine rice, a head of minced garlic cloves, salt, and oil. That’s it! For this recipe I’m using long grain Jasmine rice. I have not tested this recipe using any other variety of rice. Growing up, we ate Jasmine rice almost every night. It’s the rice I have been accustomed to and it is the most readily available type of rice in the Philippines. Eventually I’ll try making this with brown rice and other grains, but for now, Jasmine rice only! Why use old rice for fried rice? Freshly cooked rice is quite moist and fragile. Chilled day old rice is drier and studier. It will produce a much better textured fried rice. 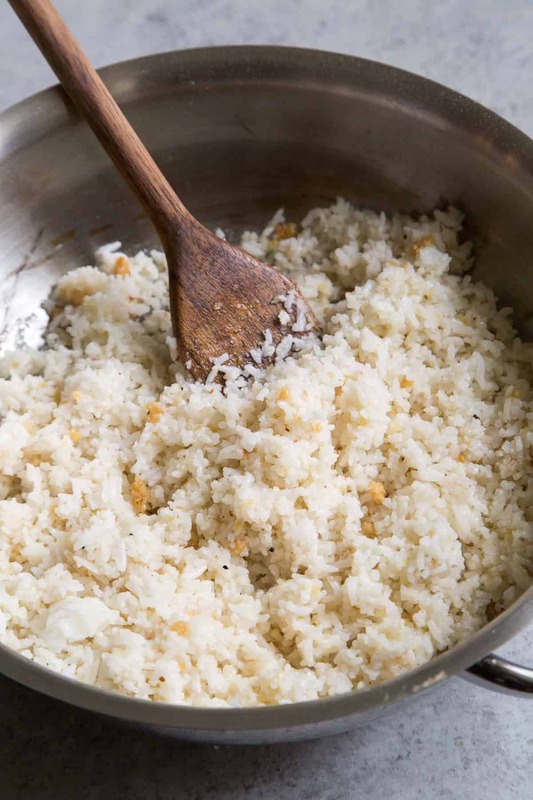 Freshly cooked rice tends to clump together, producing a sticky, often gummy mess. If you don’t want to wait a day, I suggest chilling your fresh rice in the fridge for a couple of hours. Once the rice is cold, proceed with the recipe. What’s the easiest way to mince a ton of garlic? 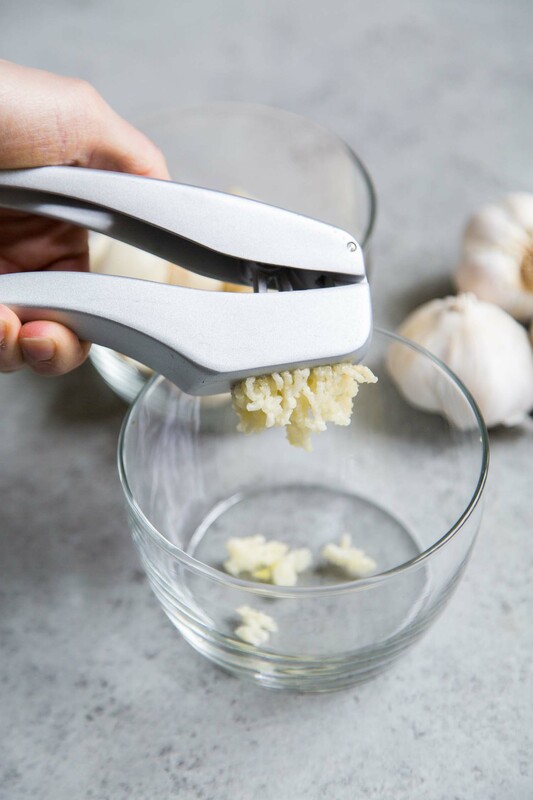 Use a garlic press! I have been using this garlic press for years. It’s my favorite one. It comes with a handy cleaning tool so you can easily wash it after use. My in-laws use the same brand and they’ve had theirs for over 10 years. It’s a good one. I promise. Does it matter what kind of oil you use for garlic fried rice? Yes! It matters what kind of oil you use! Heat a neutral flavored oil in a large skillet or wok over medium-high heat. I like to use grapeseed oil because of it’s high smoke point temperature and neutral flavor. Other suggested oils include rice bran oil, vegetable oil, and peanut oil. DO NOT use melted butter, extra-virgin olive oil, coconut oil, or sesame oil. Once the oil is shimmering, add all the minced garlic. Use a wooden spoon, chopstick, or spatula to stir the garlic around the hot pan. You want to constantly move the garlic to prevent it from burning. 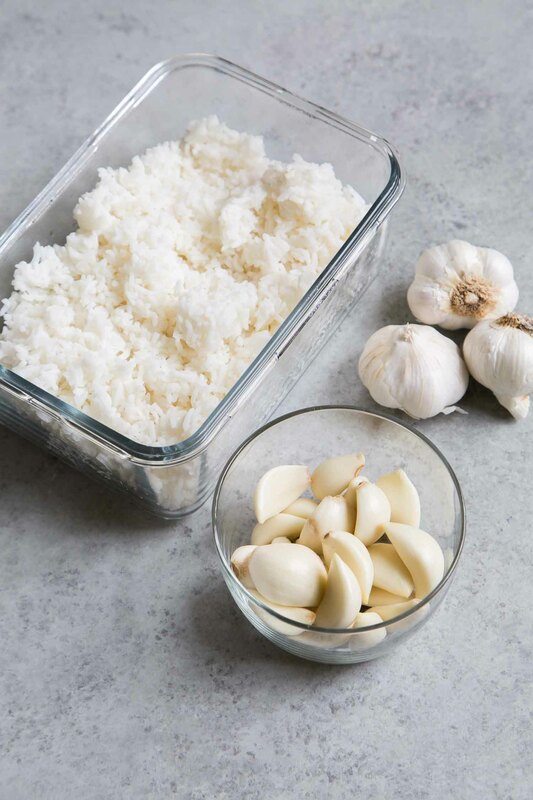 Once the garlic is lightly browned and fragrant, about 40 seconds, add the chilled rice. Add a little water to break up the rice and help reheat the rice. Once the rice is warmed throughout, seasoned with salt. That’s it! Pile the garlic fried rice on your serving plate and eat up. What are you supposed to eat with sinangag? 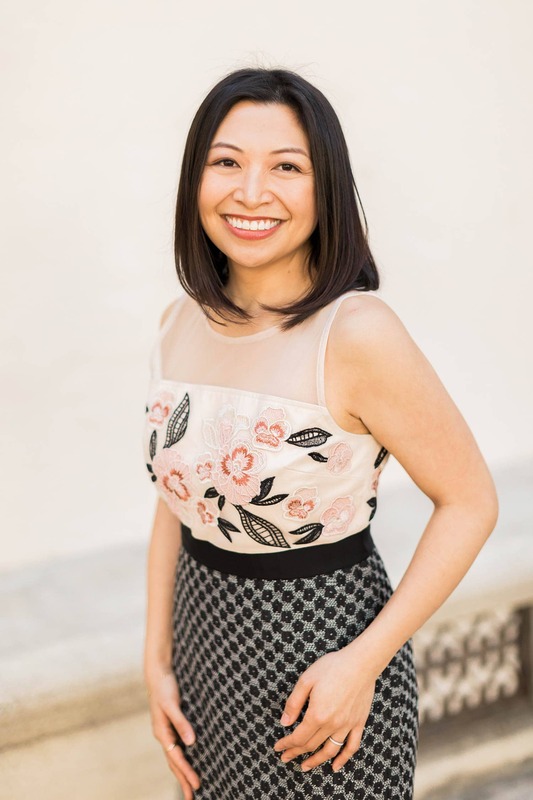 Tomorrow I’m sharing my one of my favorite Filipino breakfast meats! In a large skillet, heat 1/2 tablespoon oil over medium-high heat. Once oil is hot, add thinly sliced garlic cloves. Stir constantly to prevent garlic from burning or sticking together. Cook until lightly golden brown, about 3 minutes. Remove garlic chips using a slotted spot. Place on paper towel lined plate. Season with salt and set aside. Garlic chips will crisp up as it cools. Add remaining tablespoon oil to skillet and heat over medium heat. Once oil is hot, add minced garlic. Stir constantly to prevent garlic from burning. Cook for about 1 minute until garlic is fragrant and starting to brown. Add rice and water. Increase to high heat. Break up any clumps of rice. Toss mixture together to distribute garlic evenly. Season with salt. Cook for about 2-3 minutes until rice has been heated through. Serve immediately and garnish with fried garlic chips.